His Eminence the 12th Goshir Gyaltsabpa, Drakpa Migyur Gocha, was born in Nyemo in central Tibet on the fifteenth of the fifth month according to the Tibetan lunar calendar in 1954. His Holiness the 16th Gyalwang Karmapa recognized him at the age of three and enthroned him at Choegar Gong Monastery, the seat of the Gyaltsabpas. At the age of six Gyaltsab Rinpoche fled Tibet with the 16th Karmapa to India. They were then invited to Sikkim by Tashi Namgyal, the king of Sikkim at that time. His Eminence was trained in the Kagyu ritual tradition while living at Rumtek Monastery and completed the required memorization of texts and rituals by age seventeen. He assumed the role of Chief Ritual Master at the age of twenty-six, and to this day, Gyaltsab Rinpoche advises and guides the ritual and chanting masters on the intricacies of those disciplines. Gyaltsab Rinpoche has received all the empowerments, teachings, and instructions of the Kagyu Lineage through his unwavering devotion for his root guru, the 16th Karmapa. The preliminary practices, Vajrakilaya, Vajrayogini, Hevajra, Mahakala, Dorje Drolo, Mahamudra, the Six Yogas of Naropa, and Kalachakra are just a few of the retreats that His Eminence has completed and through his diligent practice, profound realizations dawned. The 16th Karmapa praised him by calling him “Yogi Gyaltsabpa”. Even during His Eminence’s busiest times there is not a day that goes by that he does not complete at least one full session of meditation. Fulfilling the requests of foreign disciples, His Eminence has visited many countries some of which include: America, England, Germany, Norway, Spain, Hong Kong, Taiwan, Malaysia, and the Philippines. During these trips he has bestowed empowerments, given oral transmissions, and also imparted teachings to a great many disciples. Since the time when the Karmapa controversy first arose until the present, Gyaltsab Rinpoche, following the advice given to him by the 16th Karmapa before he passed away, has stayed in India to oversee the affairs of the Karma Sri Nalanda Institute and Rumtek monastery, thus truly fulfilling his role as Regent. Gyaltsab Rinpoche and Jamgon Kongtrul Rinpoche became the Principal and Vice-Principal, respectively, of a new preliminary school for monks established by the 16th Karmapa at Rumtek in 1978. Later in 1981 Gyaltsab Rinpoche performed the land blessing, according to the instructions given to him by the 16th Karmapa, on the future site of the Karma Shri Nalanda Institute for Higher Buddhist Studies behind Rumtek monastery. His Eminence has held the position of Director of the Institute since 1987. Every year he teaches courses on Buddhist philosophy and Tantras to the students there. In 1988, at a site that had been prophesied and blessed by the 12th Karmapa, His Eminence established his new seat known as Palchen Chosling Monastic Institute. Gradually, His Eminence expanded it by adding a retreat center and nunnery. Presently, there are around five hundred monks in the monastery, more than seventy monks in the retreat center, and around one hundred nuns in the nunnery. Palchen Chosling is regarded as one of the most beautiful and famous monasteries in Sikkim. Through frequent spiritual visions experienced by His Eminence Gyaltsab Rinpoche, Rinpoche was able to know that the 16th Karmapa had taken rebirth. To honor this event and as a way to remove any obstacles surrounding his enthronement, Gyaltsab Rinpoche composed a long life prayer for him. In 1992, Gyaltsab Rinpoche and Tai Situ Rinpoche traveled to Tibet together to enthrone the 17th Gyalwang Karmapa. Since 2000, when His Holiness had risked his life by fleeing to India, His Eminence has been one of the main tutors of His Holiness. His activities as tutor include offering teachings, empowerments, transmissions, and the blessings of the unbroken lineage of realization of the Karma Kagyu school. Such empowerments and transmissions include the Treasury of Hidden Discovery, The Tantra of Buddha Vairocana, the empowerments of the Shangpa Lineage, the Kalachakra Tantra, as well as commentaries to treatises such as Distinguishing Extremes of Maitreya and many tantric commentaries including the commentary on the Kalachakra Tantra. In 2008, His Holiness the seventeenth Gyalwang Karmapa enthroned His Eminence Gyaltsab Rinpoche as his Regent, and offered the new name, Drakpa Migyur Tenpe Nyinjee. His Holiness the seventeenth Karmapa thus advised His Eminence to oversee Rumtek monastery- staying there continually until His Holiness himself arrives. As a result of this wish, His Eminence spends most of his time in Rumtek undertaking all the necessary matters such as presiding over pujas, granting empowerments, and giving monastic vows and teachings. As requested by devotees, monasteries, and retreat centers, both inside and out of Sikkim, His Eminence has granted empowerments and oral transmissions from both the Kagyu and Nyingma lineages to tens of thousands of people. Such great empowerments given by His Eminence include The Treasury of Marpa Kagyu Tantras at Mirik Monastery in 1999, The Treasury of Instructions (Damngak Dzod) at Rumtek in 2000, and The Liberating All By Knowing One (Chikshey Kundrol) at Old Ralang Monastery in 2004 just to name a few. During these times, His Eminence wakes up at two or three in the morning to accumulate the empowerments and then when the empowerments are given, His Eminence offers them with complete visualizations and meditation practices according to each specific treatise. Additionally, His Eminence gives teachings on the Six Yogas of Naropa, Mahamudra, and the Instructions of the Shangpa lineage to retreat centers and provides important empowerments when a grand puja is held at a given monastery. In 2008, the Sikkimese government envisioned and began to undertake creating the tallest statue in India of Lord Buddha. The government of Sikkim therefore requested His Eminence to provide guidance regarding this important project. Throughout the entire process, His Eminence guided the project leaders as to the style, measurements, and proportions which were to be used, and performed the necessary pujas to bless the land before construction began. The construction of the statue was successfully completed in 2010 and was consecrated by His Holiness the fourteenth Dalai Lama. The Kagyu lineage once faced the problem of not having an unbroken transmission of the commentarial teachings associated with the tantric treatises that were bestowed upon the great translator Marpa. Recognizing the vital importance of restoring this lineage of tantric commentary and propagating this lineage to others, His Eminence gave extensive teachings on what is known as The Three Tantric Texts according to the Kagyu lineage: The Profound Inner Meaning, The Uttartantra, and The Hevajra Tantra. His Eminence offered these teachings to many reincarnate rinpoches, khenpos, and shedra monks from Kagyu monasteries throughout India, Nepal, and Bhutan. His Eminence also restored the transmission lineage of The Tantra of Buddha Vairocana (Namnang Mgonjang), Chakrasamvara, Manjushri Sanghit, Kalachakra and others by locating present lineage holders to receive the transmissions from and having received the lineage transmissions, His Eminence bestowed them upon others. To plant the seeds of liberation for those beings that are born in the form of small insects such as flies, ants, and beetles, His Eminence often recites the mantra of guru Padmasambhava, known as the mantra that brings liberation by hearing, in places where insects live such as forests, the corners of rooms, and besides river banks. For animals that have died, His Eminence covers their dead bodies with cloth or paper upon which is written the mantra of Padmasambhava called the mantra that brings liberation through wearing. His Eminence then blesses the bodies of such animals through the performance of extensive practices. To benefit the insects living in rivers and other bodies of water, Gyaltsab Rinpoche often blesses water with the appropriate practices for a long time and pours the blessed water into rivers, lakes, and other bodies of water. He is known to travel long distances by vehicle to engage in such activities. Likewise, when His Eminence learns that an animal such as a dog or tiger has died, by either seeing its body personally, or learning about it from a newspaper, he himself recites prayers, performs pujas, and sends money with requests to other great Rinpoches to make similar prayers for such animals. This affection and concern for animals is clearly seen by the fact that His Eminence keeps guinea pigs and rabbits in his personal quarters, personally feeding them and providing for their needs and general well-being. To this day, His Eminence stands as the one of most prominent practitioners of Tibetan Buddhism and as an unmistaken Buddhist master known to hold the many lineages of Buddhist teachings as well as diverse meditation practices. May his life be long, and may he continue serving Buddha’s teachings and benefiting countless sentient beings! Karma Sangye Rinchen (Paul McGhee) has been a practicing Buddhist since 1999. Upon realizing his desire to become a monk he approached Lama Karma Rinchen and Lama Tempa Gyeltshen in Honolulu to guide Paul on his path to ordination. During the annual Kagyu Monlam in Bodh Gaya in 2001, he had the honor of being formally accepted by H.E. the 12th Goshir Gyaltsab Rinpoche as a student; to this day he maintains his relationship with his root lama with great care. In 2005 he received the lay vows from His Eminence and in the beginning of 2007, after his parents traveled to India to request Gyaltsab Rinpoche to ordain him, he was made a Rabjung. Since then he has been under the sole guidance of Gyaltsab Rinpoche receiving instructions in philosophy, practice, and meditation. His Eminence also bestowed the Getsul vows on him in the summer of 2008. His Eminence Goshir Gyaltsab Rinpoche has appointed Karma Sangye Rinchen as one of the resident lamas at New York Tsurphu Goshir Dharma Center. Repa Dorje Odzer (Justin von Bujdoss) has been practicing Buddhism since 1995. He has had the extraordinary fortune to study with and receive practice instructions from many great Rinpoches, Lamas, and teachers from the traditions of Theravada, Mahayana, and Vajrayana Buddhism including the late Ani Dechen Zangmo, the late Kyabje Pathing Rinpoche, the late Kyabje Bokar Rinpoche, Khenpo Lodro Donyo Rinpoche, and H.E. the 12th Goshir Gyaltsab Rinpoche, who has ordained him as a Repa. As a Repa he is committed to bringing the insights born from meditation practice into the experience of an integrated life. He has completed four units of clinical pastoral education (CPE) in the Buddhist Chaplaincy Training program established by the New York Zen Center for Contemplative Care. He has worked as a chaplain intern at New York-Presbyterian Weill Cornell Medical Center and Beth Israel Medical Center. He is the creator of the Buddhist oriented blog ganachakra.com. His interests include engaged chöd practice and the development of Buddhist tantra. His Eminence Goshir Gyaltsab Rinpoche has appointed Repa Dorje Odzer as one of the resident lamas of New York Tsurphu Goshir Dharma Center. The reincarnation lineage of His Eminence Goshir Gyaltsab Rinpoche has been described as a continuous flow of the emanations of certain Bodhisattvas and great masters. This fact has not been fabricated from nowhere; the Goshir Gyaltsabpas have been recognized and even prophesied by a number of great Buddhist masters. Indeed, such prophesies and corroborated recognition highlight a variety of qualities for which the Gyaltsabpa reincarnation line is well known. Vajrapani is one of the eight great Bodhisattvas and is known as the heart son of the Buddha entrusted with the secret treasure: the treasury of the dharma of all Buddhas of the three times. Vajrapani is not only the holder of the tantric teachings, but also the Bodhisattva who is credited with requesting and compiling all the Vajrayana teachings taught by theBuddha. In the twelfth century, Khedrup Karma Chakme, the famed Tibetan master of both the Kagyu and Nyingma lineages spent time in Tsurphu monastery. Of this experience, and the specific qualities of the Gyaltsabpa line, he confirms in his writings that the Goshir Gyaltsabpas are indeed the true emanation of Vajrapani. The Bodhisattva Samantabhadra is also one of the eight great heart sons of the Buddha. He is especially famous for making numerous generous offerings to the Buddhas of the three times, as well as making genuine heartfelt prayers for sentient beings. Samantabhadra is the essence of compassionate resolve, and his activities are expansive. Generally, there is no contradiction in the fact that the Goshir Gyaltsabpahas been recognized as the emanation of Samantabhadra even though he is generally known as the emanation of Vajrapani. To highlight this point, we can turn to the tantric treatise entitled The Treatise of Granting Empowerment to Vajrapani found within the Kangyur. In this text it is clearly explained that when the Buddha blessed Samatabhadra by placing a vajra in his hand, Samantabhadra became known as Vajrapani: the Vajra Holder. Ananda was the personal attendant of Lord Buddha. So close was he to the Buddha that the Buddha would not give teachings without Ananda in his presence; later Ananda was known for having heard and memorized nearly all of Lord Buddha’s teachings. He is credited with compiling the teachings of Lord Buddha into what has become known as the sutra pitaka; he also served as the second hierarch in the lineage of Buddhism. Generally, Ananda is widely known as the emanation of Vajrapani. Gartongtsen Yulzung was the prime minister of Tibetan King Songtsen Gampo. As prime minister, Gartongtsen Yulzung received the Chinese Princess Wencheng Gongzhu as a queen for the Tibetan King. Inherent in accomplishing this task was bringing the precious statue of Lord Buddha which is presently housed in the Jokhang, in Lhasa, to Tibet. That he was gifted with skillful means in national politics, amongst other notable skills, won him high praise from the Tang Emperor in addition to his king and other ministers. Traditionally, Prime Minister Gartongtsen is also regarded as the emanation of Vajrapani. Guru Padmasambhava, in a vision, told the seventh Karmapa that His Eminence the second Goshir Gyaltsabpa was also the reincarnation of Kharchen Palgyi Wangchuk, the brother of Yeshe Tsogyal, consort of guru Padmasambhava. Kharchen Palgyi Wangchuk attained his power, or siddhi, from the deity Vajrakilaya. It is said that he was so powerful that he could subdue any mara, or demon, by merely holding his kilaya in the sky. He was one of the 25 chief disciples of guru Padmasambhava. According to a direct encounter with the seventh Karmapa, guru Padmasambhava additionally indicated that His Eminence Gyaltsabpa was the reincarnation of Domtonpa Gyalwe Jungney. Domtonpa was the most important disciple of Jowo Atisha, the compassionate Indian Buddhist master who came to Tibet in 11th century. Atisha was the founder of the Kadampa lineage which influenced all other Tibetan Buddhist lineages. Domtonpa also established Radreng monastery in Central Tibet. Among all of the Gyaltsabpa tulkus, the fourth Gyaltsabpa, Drakpa Dondup, became one of the most important Kadampa masters of his time. He was very clearly prophesied in the text entitled, The Volume of Kadampa Teachings. The eighth Karmapa, Mikyo Dorje, recognized His Eminence the third Goshir Gyaltsabpa as the reincarnation of Rechungpa. Among the two disciples of Milarepa who are like the sun and moon, Gampopa was the sun-like disciple and Rechungpa was the moon-like disciple. A famous meditator, renowned for his devotion to Milarepa, Rechungpa became a well-known master in his own right. Amongst his activities, he traveled to Nepal where he received teachings from master Tiphupa which he brought back to Tibet. Rechungpa’s teachings spread throughout all parts of Tibet. Guru Padmasambhava likewise revealed that His Eminence Gyaltsabpa is the reincarnation of Repa Shiwa Ö, one of the chief disciples of Milarepa. Through his strong diligence ,enthusiastic effort, and unwavering devotion, Repa Shiwa Ö was a stainless vessel holding the ambrosial instructions of his master, Milarepa. It is said that as he gained complete power over his mind and wind-energies; he was known for his performance of miracles. The first Goshir Gyaltsabpa, Paljor Dondup, was born in Nyemo, central Tibet in 1424. His Holiness the sixth Karmapa, Thongwa Tonden, knowing that Paljor Dondrup would eventually become the main tutor to his successor (the seventh Karmapa, Chodrak Gyatso), sent him throughout Tibet to receive teachings from many different masters. As a result, it has been said that there was no teaching in Tibet which Paljor Dondup didn’t receive- including the Hundreds of Volumes of Buddha’s Teaching and Indian Commentaries (Kangyur and Tengyur).By the age of fourteen, as his precocious spiritual talents and mental fortitude were well-known throughout Tibet, he was appointed as the Guigong [贵公] by the sixth Karmapa. The Chinese Ming Emperor, Zhengtong [正统], offered him the title Guanding Da Gaoshi [灌顶大国师], and presented him with a golden seal and a dark blue crown. However, Paljor Dondup, in a moment of humility, decided that not wanting to give the impression of being an equal to the Gyalwang Karmapa, his master and holder of the black crown, had the crown made by emperor Zhentong enshrined within a statue of Vajradhara. Together with his spiritual friend, the great meditator Bengar Jampal Zangpo (the first Sangye Nyenpa), he diligently practiced meditation in solitude for many years. 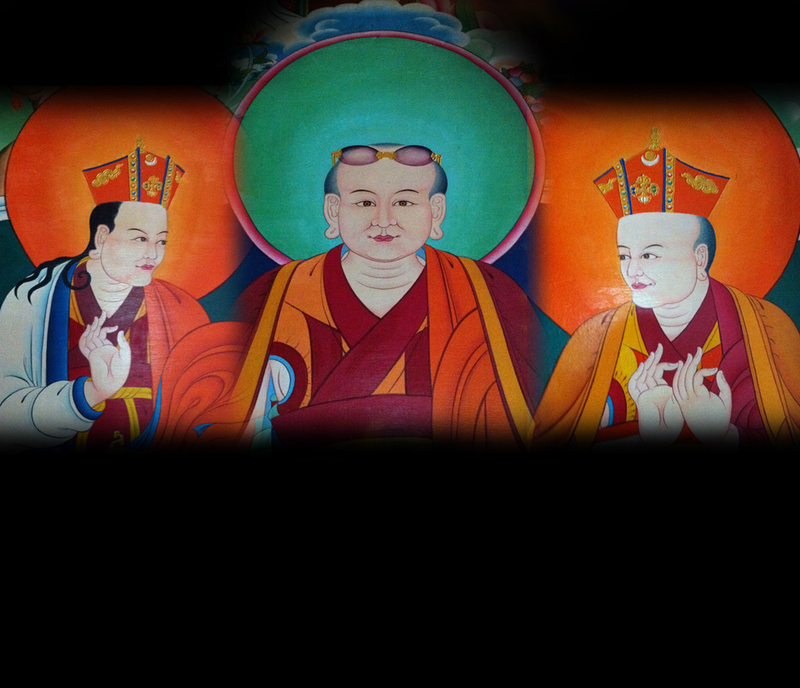 As an expression of his accomplishment, the sixth Karmapa indicated in his final testimony, which he left before he passed away, that Paljor Dondup was charged with the role of acting as the Regent of the Karmapa; amongst his responsibilities were maintaining and caring for Tsurphu monastery. While he functioned as the Regent of the Kamstang Kagyu lineage, he wasn’t formally enthroned as the Regent until later. Gyaltsabpa Paljor Dondup recognized and enthroned the seventh Karmapa, and gave him the name Chodrak Gyatso. He also acted as the main tutor of His Holiness seventh Karmapa and His Eminence fourth Shamar Rinpoche (Chokyi Drakpa); the former ended up being considered the greatest scholar in Tibet at that time, the latter was considered both a great scholar and practitioner, playing a very important role in both Tibetan religion and politics. Paljor Dondrup spent the rest of his life with Chodrak Gyatso, offering teachings, empowerments, and precious oral instructions, until the Karmapa reached the age of thirty. At this point, saying he had completed his job, Paljor Dondup passed away at Tsurphu monastery in 1486 at the age of 63. The second Goshir Gyaltsabpa, Tashi Namgyal, was born in Nyemo, Tibet, in 1487. He was recognized and enthroned as the reincarnation of Paljor Dondrup by the seventh Karmapa, Chodrak Gyatso, at the age of seventeen. As it was prophesied by Guru Padmasambhava, the seventh Karmapa made a Vajra Crown for Tashi Namgyal the color associated with magnetizing activity and installed him as the chief leader of Karma Kagyu lineage. Chodrak Gyatso declared that in essence, the Karmapa and Gyaltsabpa are inseparable, and that all of his monastic seats were to revere Gyaltsabpa the same as him. Indeed, many of those who came to receive teachings and extensive commentaries on sutra and tantra from the Seventh Karmapa instead found that it was Tashi Namgyal who gave them teachings. When Chodrak Gyatso passed away, certain parties from Karmapa’s monasteries tried to bring a false reincarnation of Karmapa. Faced with this problem, Gyaltsab Tashi Namgyal, after much difficulty, finally recognized and enthroned the true eighth Karmapa, Mikyo Dorje. During this period the Karma Kagyu lineage experienced many obstacles. Yet, due to the kindness, wisdom and perseverance of Gyaltsabpa Tashi Namgyal the lineage was restored back to its previous order. To this end Tashi Namgyal cared for and raised the eighth Karmapa as if he was his own son, personally washing the hair of the young Karmapa and caring for him as a father. The second Goshir Gyaltsabpa also offered the Upashika Vow and many teachings to Karmapa Mikyo Dorje. He then traveled to Yunan province and engaged in vast activity for the benefit of beings there. When Tashi Namgyal returned to Tsurphu he had many new statues and stupas constructed. Although Gyaltsab Tashi Namgyal was the undisputed natural choice in being the main tutor to the eighth Karmapa, he passed away before he could begin this important activity; it is rumored that he had been poisoned. As a result, the student of both Gyaltsab Tashi Namgyal and Karmapa Chodrak Gyatso, known as first Nyenpa Rinpoche, was appointed as the tutor to eight Karmapa after Tashi Namgyal passed into parinirvana at the young age of 29 years in Nyemo in 1515. The third Goshir Gyaltsabpa, Drakpa Paljor, was born in Senge Zong, in Chamdo, Eastern Tibet in 1516. Drakpa Paljor was recognized and enthroned by the eighth Karmapa, Mikyo Dorje at age eleven. He received monastic ordination from both the eighth Karmapa as well as the famous Tibetan historian Pawo Tsuglak Trengwa. Having received many profound instructions and empowerments from Mikyo Dorje, Drakpa Paljor had a vision of his guru as Chakrasamvara. Despite the fact that he held the title of Guigong, he was requested to take the role of general-secretary of the Karmapa’s Great Encampment- the famous traveling tent city that housed the Gyalwang Karmapa as he travelled throughout Tibet to benefit beings. Gyaltsabpa Drakpa Paljor accepted the position; however his primary focus was meditation practice. Because of this he was regarded as a true yogi. On many occasions, he had visions of a number of deities. Since his students invited him to teach in many locations, and he spent much time traveling,and he didn’t live very long; he died at the age of thirty one. Drakpa Paljor passed away on the glorious mount Yarlha Shampo, in 1546, promising that in his next life he would lead all of his disciples to the pure land of Padma Ö, the Light of Lotus. The fourth Goshir Gyaltsabpa, Drakpa Dondup, was born in Nyemo, Tibet, in 1547. He was recognized and enthroned by eighth Karmapa, Mikyo Dorje. The eighth Karmapa also offered long life blessings so that there would be no impediments to his lifespan and thus benefit many beings. Drakpa Dondup’s main teachers were Mikyo Dorje and the fifth Shamarpa, Konchok Yenlag. Under their tutelage Drakpa Dondup excelled and became a learned master in all sciences such as sutra, tantra, literature, astrology, and poetry. As a result of his astute learning and deep realization, Drakpa Dondup became tutor to most of the well-known Tibetan scholars of the time, including the fifth Tai Situpa, a number of Tibetan political leaders of the Phagmodrupa dynasty, as well as the famous Tibetan historian and Jonangpa lama, Taranatha. Traveling all over Tibet, Drakpa Dondup was well known for giving teachings on both sutras and tantras, yet he preferred to teach tantric treaties. A master with great depth and breadth, Drakpa Dondup was also an accomplished artist, so much so that along with the fifth Shamarpa, he founded the Karma Gadri tradition of thanka painting. Drakpa Dondup held a unique connection with the Kadam lineage in that he was prophesied by past Kadampa masters that he would benefit and enrich the Kadampa teachings. As a natural expression of this connection, he composed a treatise on Atisha’s seminal text Lamp to the Path of Enlightenment and worked to propagate the Kadam tradition. A gifted writer, he composed many literary works including a biography of Marpa the Translator, a detailed explanation of Hevajra practice, and a practice manual for the Six Yogas of Naropa, to name a few. The fourth Gyaltsabpa was also known for compiling the biographies of a number of important Kagyu Rinpoches of that time. His biographies are known for their clarity and detail and to this day serve as important historical references. His written works often seem as if they are written by different people; some works are very cosmopolitan while others express the classical style of the eleventh century. The depth of quality and timelessness that his literary works reflect have left a lasting mark upon Tibetan literature that endures. Drakpa Dondup passed away at the age of sixty-seven, at Tsurphu, in 1613. Central to the history of the Karma Kagyu as an important force that held the lineage together, whose story is virtually unknown these days, is the story of the life of the fifth Goshir Gyaltsabpa, Drakpa Chokyang. As lama to Lhatsun Namkha Jigme, he also had a profound effect on the dharma in Sikkim. Drakpa Chokyang was born in 1616 in Tsang province, Tibet, to a family of Tibetan government officials. He was recognized by the tenth Karmapa, Choying Dorje, when he was eight years old. Taranatha, the great master of the Jonang lineage and well known scholar of the Kalachakra tantra, offered the young Drakpa Chokyang the teachings of the Kalachakra tantra and foretold that he would become an outstanding master. Drakpa Chokyang did indeed become great master in many different fields of knowledge including various scripts, Sanskrit, Pramana, or logic and philosophy, and other subjects.During a turbulent period in history that witnessed many raids by the Mongols into Tibet, the Tibetan political leadership requested Drakpa Chokyang to use his spiritual powers to repel the growing Mongol attacks. Drakpa Chokyang offered the help that was requested of him, and for the time being the threat from the Mongols dissipated. Lhatsun Namkha Jigme, the lama that propagated Buddhism in Sikkim and appointed the first king of Sikkim was a student of fifth Gyaltsabpa. Drakpa Chokyang gave him many teachings, including instructions in how to open the route to Sikkim, which was known at that time as Hidden Valley. Drakpa Chokyang was also very close to many other outstanding masters of the day including His Holiness the fifth Dalai Lama, His Holiness the Panchen Lama, and Taklung Shabdrung Rinpoche. Later, as the political situation in Tibet became increasingly difficult to negotiate, Mongolian armies conducted extensive invasions into Tibet, destroying many Kagyu monasteries and killing many monks and nuns. The tenth Karmapa fled with the other important Kagyu rinpoches to Lijiang to escape the incredible violence and chaos. Drakpa Chokyang chose to remain in Central Tibet where eventually the fifth Dalai Lama, Ngawang Lobsang Gyatso, became both the religious and political leader of Tibet. Due to the close relationship between Drakpa Chokyang and the fifth Dalai Lama, Drakpa Chokyang was able to offer leadership and meaningful guidance that helped to resolve the existing problems that faced the Kagyu lineage as it struggled to survive in a period of heightened sectarian violence and political instability.The fifth Dalai Lama appointed him as the spiritual leader of the entire Karma Kagyu lineage. The fifth Dalai Lama also restored to Gyaltsabpa Drakpa Chokyang the twenty one monasteries of Karma Kagyu lineage including, Tsurphu monastery (Seat of the Karmapas) and Yangpachen monastery (Seat of the Shamarpas). Thus, the fifth Gyaltsabpa played a pivotal role in reviving the Karma Kagyu tradition; without his influence it would be difficult to imagine what the lineage would look like today. For many years Drakpa Chokyang was the only senior Kagyu rinpoche remaining in central Tibet and was forced to face, and resolve, the many difficulties that faced the Kagyu lineage in it’s fragile state alone. It is said that he passed away at the age of forty-three at Tsurphu monastery, in 1648, feeling great sadness. The sixth Goshir Gyaltsabpa, Norbu Zangpo, was born in Lijiang, Yunan Province in 1660. It is generally believed that he was the son of the Tenth Karmapa, Choying Dorje. At that time, Karmapa and the all heart sons were in Lijiang having sought refuge from the political discord in Central Tibet. When conditions were favorable for their return to Central Tibet, they returned to Tsurphu. The tenth Karmapa ordained Norbu Zangpo as an Upashika and enthroned him as the Gyaltsab, or Regent. His Holiness the fifth Dalai Lama performed the hair cutting ceremony for Gyaltsab Norbu Zangpo, praising him for the uncharacteristic sharpness of his mind and the openness with which he spoke given his young age. The sixth Gyaltsabpa was closely cherished by Choying Dorje; as a sign of this closeness the tenth Karmapa gave him Choegar Gong monastery. Since then, the Gyaltsab reincarnations have their own separate seat at Choegar Gong monastery, situated just above Tsurphu. Together with the seventh Shamar Rinpoche, Yeshe Nyingpo, Gyaltsab Norbu Zangpo traveled to eastern Tibet and recognized the eleventh Karmapa, Yeshe Dorje. Having enthroned the eleventh Karmapa, Gyatlsabpa Norbu Zangpo offered all of the sacred instructions, empowerments, and teachings to the young Karmapa. He was specially remembered for his wonderful poetry, and was also the source of inspiration for poetry as well; a generation later, the great Tibetan scholar and Kagyu master, the eighth Situpa, Chokyi Jungney, wrote many poems about the sixth Gyaltsabpa. Gyaltsabpa Norbu Zangpo passed away at Tsurphu at the age of thirty nine at Tsurphu, in 1698. The seventh Goshir Gyaltsabpa, Kunchok Odzer, was born in Nyemo, central Tibet, in 1699, to a family whose line goes back to Thonmi Sambhota and the Translator Vairochana. The twelfth Karmapa, Changchub Dorje, and eighth Shamar Rinpoche recognized him at the age fifteen and invited him to his seat at Tsurphu where he was enthroned. At the age of twenty three, along with His Holiness Karmapa and the other heart sons, Shamar Rinpoche and Situ Rinpoche, he went on pilgrimage in Nepal. While in Nepal the king, his ministers and much of the population served and assisted the Karmapa and his heart sons including Gyaltsabpa Kunchok Odzer. During their stay, the heart sons, as well as the Karmapa worked to pacify a variety of serious calamities that affected the people of Nepal. Later, after returning to Tibet, Kunchok Odzer spent three continuous years in retreat at Tsari, Tibet’s most well-known sacred site, for a period of intensive meditation practice. When the eighth Shamapra passed away, both Gyaltsabpa Kunchok Odzer and Situpa Chokyi Jungney recognized different Shamarpa incarnations. The one that Konchok Odzer recognized became known as Namling Shamar Rinpoche who became both a great scholar and spiritual master. It was written by one famous Nyingmapa historian, that there was no point in talking about his deep realization, no one can compare with even his daily moral conduct. The candidate put forward by Situpa Chokyi Jungney died at a very young age and subsequently another was installed by Situpa which came to be known as the Tenth Shamarpa Chodrup Gyatso. Gyaltsab Kunchok Odzer recognized the thirteenth Karmapa, and took great care in attending to his personal needs as well as his education and training throughout the thirteenth Karmapa’s childhood. Later, the seventh Gyaltsabpa was revered as the “very kind Kunchok Odzer” in the Karma Kagyu guru lineage supplication. Gyaltsabpa Kunchok Odzer passed away into parinirvana at the age of sixty seven in 1766 at Tsurphu. The eighth Goshir Gyaltsabpa, Choepal Zangpo, was born in the palace of Lijiang, in Yunan Province. He was recognized by the thirteenth Karmapa, Dudul Dorje and Tai Situpa Chokyi Jungney. From there he was invited to Palpung monastery in eastern Tibet when he was eleven years old where he received many teachings from Tai Situ Rinpoche. He was regarded as the most learned disciple of Situ Chokyi Jungney. At the age of fourteenth, he returned to his own monastery at Tsurphu, living in close contact with his guru, the Karmapa. At one point in his travels, when he was returning to Lijiang and Kham, and while in Lithang, Gyaltsab Choepal Zangpo came across a small retreat house that was used by Lord Phagmo Drupa. On this site he established a new monastery called Druje Monastery which eventually became the second monastic seat of the Gyaltsabpas. He left many hand prints and foot prints in the rocks near Druje monastery; these are visible to this day. Later, while traveling in the northern regions of Tibet, Choepal Zangpo arrived in a valley where the local population was suffering; many people and animals were dying for no apparent reason. Gyaltsabpa Choepal Zangpo removed all the obstacles plaguing the area and since then the region has enjoyed rich harvests, while the inhabitants, both human and animal, have enjoyed long life and good health. For that reason people of that region continue to maintain deep faith in the Gyaltsabpas. At their request, he built a monastery there which became the third monastic seat of the Gyaltsabpas. His last major work was the enthronement of fourteenth Karmapa. The eight Goshir Gyaltsabpa, Choepal Zangpo, passed into parinirvana at Tsurphu in 1822, at the age of 54. The ninth Goshir Gyaltsabpa Yeshe Zangpo was born in Kongpo, in 1823. He was enthroned on the throne of the Regent by the fourteenth Karmapa, Thekchok Dorje. When he was young, Yeshe Zangpo had a very unique tooth which many people felt arose as the Gyaltsabpas are held to be the emanation of Vajrapani. In fact, many Rinpoches foretold that this tooth was a sign of auspiciousness and that it should be kept. Unfortunately, his main attendant disregarded the auspiciousness of this sign and polished the tooth, slowly reducing it to normal.Yeshe Zangpo occasionally wore the dress of a layman and spent his time gambling. It is said that he lost many important objects from the monastery to others because of his gambling. When faced with inquires from his attendants regarding the missing objects, he jokingly reassured them, “don’t worry, this will remove obstacles in my future lives”. The ninth Gyaltsabpa’s appearance was said to be magnificent, it was common for people to say that he looked very much like guru Padmasambhava. When he returned to the northern region where the previous Gyatsabpa had built a monastery, Yeshe Zangpo extended the monastery building and personally made the rules and regulations for the monks according to the Vinaya. Yeshe Zangpo was especially famous for having powerful clairvoyance and for openly subduing demons. Yeshe Zangpo was also known for possessing a unique jewel that was offered to him by a non-human entity. It was kept in his monastery where during the night it would shine, emitting a small light; even the most well-talented merchants could not figure out what it is made of. He lived the life of a great yogi. Gyaltsabpa Yeshe Zangpo passed into parinirvana at Tsurphu in 1862 at the age of 39. The tenth Goshir Gyaltsabpa, Tenpe Nyima, was born in Lhasa, the capital of Tibet, in 1863. His teachers were the fifteenth Karmapa Khakhyab Dorje and first Jamgon Kongtrul Rinpoche. Tenpe Nyima frequently visited the monastic seat of the Gyaltsabpas located in the northern regions of Tibet, and while there, he constructed many statues and stupas, and installed a complete copy of the collection of Buddhist scriptures. Tenpe Nyima also took great care in modifying the moral code used by the monks living there.Gyaltsabpa Tenpe Nyima was also an expert physician. When patients from far away could not meet him directly, they sent their shoe laces to Tenpe Nyima who was able to ascertain every detail regarding the particular disease that the individual suffered from, and what medicines they should take. He was also known for examining the color and weight of his patients as a means to gain better knowledge of their immediate health concerns, a method used by well known Tibetan physicians. It is said that through his spiritual power and talent as an herbalist, patients recovered very quickly after following Tenpe Nyima’s medical advice.The tenth Gyaltsabpa frequently met with beggars in Tsurphu providing them food and clothes, teaching them how to speak with people in a respectful way. He even invented a new method for making shoes for those beggars who were unfortunate enough to be missing one hand. Tenpe Nyima had very gentle personality, so much so, that even when his attendant monks made trouble, the tenth Gyaltsab Rinpoche never scolded them. Having spending most of his life dedicated to meditation practice, at the age of thirty two, Goshir Gyaltsabpa Tenpe Nyima passed away into parinirvana at Tsurphu in 1894. The elventh Goshir Gyaltsabpa, Drakpa Gyatso, was born in Lhasa just next to the Potala palace, in 1895. He was enthroned as the Regent of the Karma Kagyu lineage by the fifteenth Karmapa, Khakhyap Dorje when he was eight years old. His Holiness the thirteenth Dalai Lama considered it a great honor and symbol of auspicious circumstance that the reincarnation of Goshir Gyaltsab Rinpoche was born in the vicinity of his palace. As a direct result of this, Drakpa Gyatso was invited by the Dalai Lama to perform a long life puja every year; during these pujas many people found that the long life pills that Gyaltsabpa Drakpa Gyatso consecrated miraculously increased in number. This led many Tibetans to believe that he attained a state of immortality. Generally, according to Tibetan custom, as a sign of respect, it is considered a mark of poor manners if one speaks highly about other rinpoches while in the presence of the Dalai Lama. However, whenever His Holiness the thirteenth Dalai Lama would ask Gyaltsab Drakpa Gyatso, “from where have you come today?” Gyaltsab Rinpoche always responded with his eyes in the gaze of meditation saying, “I have come from the presence of the great victorious His Holiness Gyalwang Karmapa”. This greatly pleased the thirteenth Dalai Lama who very much liked Gyaltsab Rinpoche- to this end, the Dalai Lama declared that Drakpa Gyatso was in every way a true yogi. Indeed, Drakpa Gyatso’s respect for his guru, the Karmapa, was so great that when the news of the fifteenth Karmapa’s death reached Drakpa Gyatso, it is said that he immediately became unconscious and fell down the staircase next to where he was standing when he heard the terrible news. Since his family and most of his relatives held important positions within the Tibetan Government, the relationship between the Tibetan government and Gyaltsab Drakpa Gyatso’s monastery was very close. After his holiness the sixteenth Karmapa, Rigpe Dorje, was born in Eastern Tibet and was enthroned, the eleventh Gyaltsabpa received His Holiness Karmapa at Tsurphu, thereby installing the 16th Gyalwang Karmapa at his monastic seat. Throughout the entirety of his life, Gyaltsab Drakpa Gyatso emphasized the four dharmas of wholesome training as the essence of his practice. The four dharmas of wholesome training consist of not scolding another when one is scolded, not being incited to anger when another is angry with us, not hitting another when we are being hit, and not revealing another’s faults when one points out our own. When Drakpa Gyatso passed away at Tsurphu in 1952, there was a retreat master who was known as a very good practitioner called Chikhang Lama who lived near Tsurphu. One night Chikhang Lama had a vision that tenth Gyaltsabpa came to meet him in the form of Thousand Armed Chenrezig, but in blue color and riding a horse. Gyaltsab Drakpa Gyatso told him: “Now I am going to the north and soon we will meet again”. In the morning, when Chikhang Lama shared his vision with his disciples, the disciples requested him to not to mention such bad signs since Gyaltsab Rinpoche was known to still be alive. But soon, the news of the eleventh Goshir Gyaltsabpa’s passing arrived and everyone was surprised. Just as in Chikhang Lama’s vision, the present twelfth Gyaltsabpa was born in Nyemo, directly north of Tsurphu. After he passed away into parinirvana, when Taklung Matrul Rinpoche performed his funeral puja, wonderful signs of realization such as rainbows of diverse colors emanated from his bones and bodies and went to northern direction.